Visitors who enter Old Fort Niagara through the South Redoubt are first impressed with the French Castle, standing on the far side of the parade ground. Less noticed perhaps is the tall, almost windowless building to the left; the Powder Magazine. Erected in 1757, at the high water mark of French fortunes during the French and Indian War, the magazine today reminds us of France's far-flung North American empire at its zenith. It also stands as a monument to its designer, Captain Pierre Pouchot who created a structure that survived a desperate siege and was used for ammunition storage into the twentieth century. Powder magazines may not be the most interesting of structures, until something goes wrong. History is full of accounts of gunpowder supplies exploding with disastrous consequences. One of the earliest recorded incidents of accidental explosion occurred in 1280 when Mongols blew up a Chinese arsenal through carelessness. Erasmus described a devastating explosion in Basel, Switzerland in the early 16th century and a powder supply in Delft, Holland exploded on October 12, 1654 destroying much of the city. In this last incident, about 40 tons of powder, stored in a magazine that formerly served as a Clarissen convent, blew up when the magazine's keeper, Cornelis Soetens, opened the door of the magazine to check a sample of the powder. Over a hundred people were killed and thousands injured. Luckily, many of the city's residents were away from home. The damage was portrayed by the artist Egbert van der Poel in his painting A View of Delft after the Explosion of 1654. The stakes were indeed high; one spark could wreck a fortress or town and kill half of its inhabitants. The disadvantage of underground magazines was dampness. Gunpowder that drew damp became little more than a useless sooty black paste. Above-ground storage was certainly a better option for keeping the powder dry, but such magazines were much more exposed to enemy fire. To compensate, they had to be built with thick stone walls, and arched ceilings to render them bombproof. 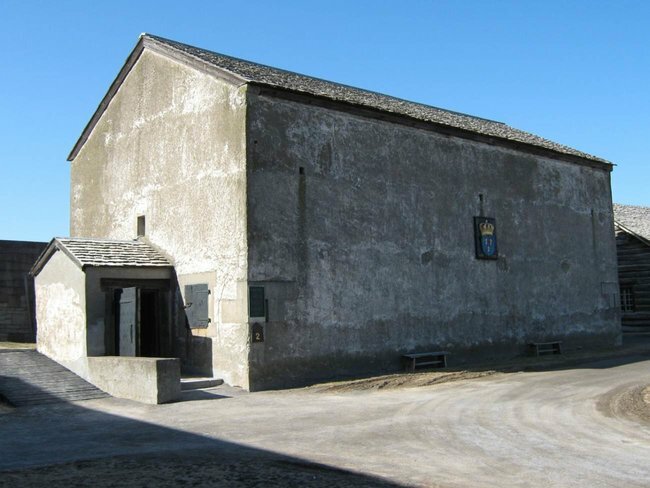 Vauban's designs provided a valuable starting point for Captain Pierre Pouchot as he set out during the winter of 1756-57 to construct a new powder magazine at Fort Niagara. Pouchot had spent the winter of 1755 and the first half of 1756 at Fort Niagara erecting temporary barracks and constructing massive earthworks designed to withstand artillery fire. From this time he undoubtedly realized that the existing magazine at the west end of the French Castle was far too small to house the powder supply an expanded fort would need. After a brief sojourn at the siege of Oswego (see the March 2006 issue of Fortress Niagara), and a road building assignment at La Prairie, Pouchot returned to Fort Niagara in October 1756 to complete the transformation of the post. This time he was placed in command of the Fort, a post that had previously been reserved for officers of the colonial regulars (compagnies franches de la Marine), not regular army officers from France. On his journey to Niagara, he was accompanied by soldiers from three army regiments, his own Bearn Regiment, the Guienne Regiment, and the La Sarre Regiment. Pouchot sited his new powder magazine at the southern end of the enlarged fort, next to a newly built provisions storehouse. To make room for the magazine, he tore down a temporary barracks that had been constructed the year before. Pouchot probably imported the stone for the magazine from Cataraqui (Fort Frontenac) where modern Kingston, Ontario stands today. The stone was transported across Lake Ontario aboard a fleet of sailing vessels that France maintained on Lake Ontario. In addition to the magazine, Pouchot superintended the construction of new log barracks, storehouses, a forge, stable, hospital and church. In January 1757 he dispatched a report to the Marquis de Montcalm reporting progress on these buildings. Bitter cold however, retarded the work. Construction continued through the spring and summer months, and as of May, Montcalm recorded that the magazine at Fort Niagara was not yet finished. During this time, Pouchot had more on his mind than construction. Relations with Native allies from the Great Lakes and Midwest consumed much of his time as hundreds of warriors gathered at Niagara. Some came to form war parties to attack English settlements to the south, while others passed through on their way east to join the French Army in an attack on British Fort William Henry on Lake George. By September, 1757, Pouchot could report that Fort Niagara and its buildings were finished and its covered ways stockaded. His task completed, Pouchot was relieved of his command in October 1757. In his memoirs he wrote “Since this fort was a very considerable one, because of its position and the large number of Indians who had dealings there and came from all parts to trade and form war parties, it was soon coveted by all of the officers of the colony.”4 Pouchot was relieved by Captain Jean Francois de Vassan of the colonial regular troops. The magazine Pouchot left behind was one of the largest in the colony, designed to hold up to 50 tons of gunpowder. The building's four-foot thick stone walls, earth covered arched ceiling, and steep gabled roof is strikingly similar to Vauban's standard designs that graced fortresses throughout France. Conspicuously missing from Pouchot's magazine, however, were the massive stone buttresses that Vauban used to strengthen the arched ceilings of his magazines. Whether these were omitted as a frontier expedient or through inexperience is not known. Regardless, Pouchot left the Fort with a substantial above-ground powder magazine that was capable of withstanding the artillery that British forces were likely to drag and float west from the Mohawk Valley. Inside the building, wooden racks extended from floor to ceiling, holding hundreds of powder casks, each of about 50 pounds capacity. In all, about fifty tons of gunpowder could be safely stored until needed. 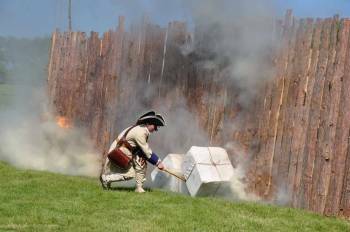 Ironically, much of the powder stored in the magazine during the final years of French occupation may have been British in origin, captured from General Edward Braddock or at the fall of Forts Oswego and William Henry. The question arises, why such a large magazine? The answer lies in the Fort's own need for a large powder supply and its role as a supply depot for other French posts in the upper Great Lakes and the Ohio Valley. By 1757 Fort Niagara was well armed with 30 pieces of artillery including twelve 12-pounders according to Captain Francois Marc-Antoine Le Mercier, commandant of artillery in New France. 5 In the event of a protracted siege, a large powder supply would be necessary, as subsequent events were to demonstrate. Fort Niagara also forwarded powder supplies to posts in the upper Great Lakes and in the Ohio Valley. As the years passed a few changes were made to the building. Prior to the American Revolution, the British added a small entryway that survives today and added buttresses to the building exterior. These were removed in the mid-19th century when windows and ventilation slits were also added. The building remained sound for ammunition storage into the twentieth century; as late as World War One, the United States Army stored ammunition in Pouchot's magazine. Perhaps the most infamous story surrounding the magazine is the incarceration there of William Morgan, an early nineteenth-century anti-Masonic activist. Morgan was imprisoned in the magazine just before his mysterious disappearance in 1826. Following its restoration between 1932 and 1934, the powder magazine served as an exhibit building, containing orientation exhibits. Restoration of the building was made possible through the generosity of Wallace I. Keep and the building was dedicated as L' Institut d' Honneur on October 5, 1935. Ironically, the plaque dedicating the building lists its builder as Captaine Francois Pouchot. With the opening of the Visitor Center in 2006, the building interior was cleared of exhibits and was restored to its 18th century appearance through a special projects grant from the United States Department of Housing and Urban Development. Used as ammunition storage, a vault for valuables, a prison, and an exhibit gallery, the powder magazine's changing usefulness has allowed it to survive where many others have crumbled. 1. Travelers wishing to visit an underground magazine from this period can tour one at Fort Ligonier in Ligonier Pennsylvania. Photographs and drawings of this structure can be found in Charles Morse Stotz, Outposts of the War for Empire, (Historical Society of Western Pennsylvania, 2005) pp 172-175. 2. See Christopher Duffy, Fire and Stone: The Science of Fortress Warfare, 1660-1860 (Greenhill Books, London 1996) pp. 91-92. See also Paddy Griffith, The Vauban Fortifications of France (Osprey Publishing, Oxford, 2006). 3. See Ian Steele, Betrayals: Fort William Henry and the “Massacre” (Oxford University Press, 1990). 4. Pierre Pouchot Memoirs on the Late War In North America Between France and England, Brian Dunnigan, ed. (Old Fort Niagara Association Youngstown, NY 2004) p. 133. 6. See Matthew C. Ward, Breaking the Backcountry: The Seven Years War in Virginia and Pennsylvania. 1754-1765. (University of Pittsburgh Press 2003). 7. M. de Vaudreuil to M. de Massiac, Nov. 1, 1758. DRCHSNY v. X p. 863. Winter will soon be upon us and our thoughts will turn from travel and outdoor activities to hearth and home. Today most of us take central heating and a comfortable indoor temperature for granted. A flick of the thermostat is all that’s needed to keep warm during even the coldest days of winter. Woodcutting on the farm was the responsibility of men and boys, who spent long hard days in the woods harvesting trees for fuel. The best time to cut firewood was in the winter months when snow on the ground allowed relatively easy transport by sleigh from woodlot to dooryard . Winter was also the time when farmers had the time to lay in a store of firewood for the following year. This timetable allowed the wood to dry and season before it was needed. [ii] While cutting wood was best done during December, January and February, the arduous task of splitting and stacking was a year-round occupation. Providing firewood for a frontier military garrison intensified the challenges facing farmers. Even a reduced garrison of 30 to 40 men required a great deal of firewood for heating, cooking, baking, laundry, cleaning and hygiene. Ancillary activities like charcoal manufacture and lime burning also consumed large amounts of wood. When Captain Daniel Hyacinthe Lienard de Beaujeu assumed command of Fort Niagara in July of 1749, he lamented to New France’s Governor, Roland-Michel Barrin de La Galissonière, “There are here no more than 50 cords of wood of the 1,200 which are consumed annually.”[iii] That means, by Beaujeu’s estimate, the Fort consumed about 30 acres of trees each year when its footprint was still relatively small. I am concerned to report to Your Excellency a circumstance of an unpleasant nature which occurred at Fort Niagara which..may be principally attributed to the want of exertion, or…to the neglect of the commissariat in not throwing a supply of that indispensably necessary article, fuel, into that place. Thus gathering firewood could be a mundane, arduous and even dangerous task, but one that was never far from the minds of Fort Niagara’s winter garrisons. [i] The Farmers’ Museum: Cutting Firewood: Preparing for Winter, Part 2. http://thefarmersmuseum.blogspot.com/2010/cutting-firewood-preparing-for-winter.html. Fireplaces were only about 10% efficient, with most of the heat going up the chimney. Stoves came into use during the 18th century but for most, the fireplace was still the most common form of heating. Peter Kalm, visiting New France in 1749 noted stoves in use, including military installations in Quebec. [ii] See Nylander, Jane C. Our Own Snug Fireside: Images of the New England Home 1760-1860. 1993 Alfred Knopf, NY pp. 82-84. [iii] Beaujeu to de la Galissoniere, July 7, 1749. [vii] Grant to Graves, Oct 23, 1767 Haldimand Papers 21678. McTavish was Simon McTavish, possibly a clerk for the Naval Department at Niagara. [viii] Caldwell to Gage, November 2, 1774, Gage Papers, v. 124. During the American Revolution (1775-1783) the British controlled the Great Lakes and maintained headquarters for the region at Fort Niagara. The Fort's commandant exercised military command over the vast northwestern frontier and was responsible for maintaining alliances with Native peoples, moving supplies to western posts, and protecting the Fort from attack. After 1777 the commandant also dispatched raiding parties that struck the New York and Pennsylvania frontiers. Two remarkable men who served in this weighty position, Lt. Colonels John Caldwell and Mason Bolton, died on the same day, October 31, four years apart. Just prior to the outbreak of the Revolution, the 8th Regiment of Foot was ordered to garrison Fort Niagara and a number of smaller outposts throughout the Great Lakes. The regiment's field commander, Lt. Colonel John Caldwell, arrived at Fort Niagara in August 1774. Caldwell had served in the British Army since the 1740s and was about fifty years old when he assumed command of the isolated outpost at the mouth of the Niagara River. Ten months later, word reached Fort Niagara that British troops and Massachusetts militia had clashed at the battles of Lexington and Concord. Caldwell now assumed the onerous task of preparing Fort Niagara for war. Strengthening the Fort was made more difficult when American forces invaded Canada late in 1775. 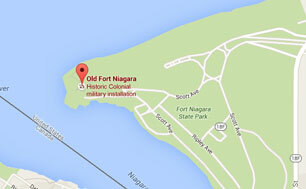 Now, Fort Niagara was cut off from supplies and communications with England. The Fort's garrison spent a miserable winter in a starving condition. By summer 1776 British forces had regained control of the St. Lawrence Valley and the flow of supplies to Fort Niagara resumed. Caldwell now turned his attention to securing support from the powerful Six Nations of Indians. In September he assisted with a grand council where part of the Six Nations declared their allegiance to the British; a major diplomatic success. Unfortunately a combination of harsh winter weather, poor diet and overwork began to take its toll on Colonel Caldwell's already delicate constitution. Early in October he reported that his “ill state of health” kept him from fulfilling his duties. On October 31 he succumbed to a lengthy, unidentified illness. When word of Caldwell's passing reached General Guy Carleton, Governor of Quebec, he immediately appointed a successor, Lt. Colonel Mason Bolton of the 9th Regiment of Foot. Until Bolton was able to reach Niagara in July 1777, Captain Richard Lernoult held temporary command of the Fort. Like Caldwell, Bolton had begun his career in the British Army during the 1740s. He now oversaw Fort Niagara's rapidly expanding role in the events of the Revolution. A British plan to invade New York during 1777 via the Lake Champlain/Hudson River corridor involved a supporting attack down the Mohawk River from the west. This expedition, under the command of Brigadier General Barry St. Leger drew troops and Native allies from Fort Niagara but stalled at present Rome, NY when Crown forces were unable to capture the American-held Fort Stanwix. After the failure of the 1777 campaign, British officials at Fort Niagara turned their attention to outfitting raiding parties to attack the frontiers of New York and Pennsylvania. The most famous of these units, Butler's Rangers, was raised among Loyalist refugees who had been fleeing to Fort Niagara since 1776. Growing numbers of Native Americans also arrived at Fort Niagara, some to seek succor from British forces and others to obtain supplies for launching raids on the frontier. By 1779 a series of devastating Loyalist and Native attacks on frontier settlements led General George Washington to order a 4,000-man expedition to “chastise” the Six Nations. Led by General John Sullivan, American troops came within 85 miles of Fort Niagara but lacked the supplies and artillery needed to attack the Fort. Bolton meanwhile strengthened the Fort and dispatched troops to help defend the territory of the Six Nations. With their villages and crops largely destroyed, thousands of Native refugees converged on Fort Niagara during the winter of 1779-80 where many starved to death. By Fall 1780, Lt. Colonel Bolton's health began to fail and he asked to be relieved of his command. In early October he received permission to return to England. On October 31, Bolton boarded the snow H.M.S. Ontario for well-deserved leave. Later that evening the vessel was engulfed in a sudden lake storm and sank with no survivors. Several efforts were made to locate the wreck of the Ontario over the years but it was not until 2008 that divers Jim Kennard and Dan Scoville located the sunken vessel using sophisticated side-scanning sonar and an underwater remote operated vehicle. Today, Lt. Colonel Bolton's remains lie at the bottom of Lake Ontario while those of Lt. Colonel Caldwell rest under the grounds of historic Old Fort Niagara. Both men commanded Fort Niagara with honor and considerable skill. Oddly, both died on Hallowe'en. Fort du Portage, also known today as Fort Little Niagara, was erected in the spring of 1751 at the upper landing of the Niagara Portage. The purpose of the Fort was to bolster French trade, strengthen ties with Natives from the upper country, and better protect the strategically important portage, a vital link in the route from Canada to the Ohio Valley. The new fort was placed under the authority of Lieutenant Daniel-Marie Chabert de Joncaire de Clausonne. Joncaire was not only the commandant of the Fort, he also held the trade concession at the post. Fort du Portage was described as including a log trading house with lodging for a clerk, a room for housing the 10 soldiers of the guard, and a little room for the Commandant. All of this was enclosed in a triangular-shaped palisade described as “somewhat flanked.” By April 1753 a new building had been added, probably outside the stockade, for the construction of bateaux and canoes. After the outbreak of the French and Indian War, two additional improvements were made; the construction of a new house for commissary clerks and other workers and a shed for government stores. Just prior to the British invasion, Joncaire recorded that the complex included a stable 100 feet long and a shed of 40 feet. There was also a 42-foot long barn, a residence for the Commissary, and a house for the Commandant and workmen. When Fort Niagara was besieged in July 1759, Joncaire received orders from Captain Pierre Pouchot to destroy Fort du Portage if the British approached. Fearing that the fort was indefensible, Joncaire burned it on July 8, casting a large quantity of trade goods and stores into the river. Joncaire was ruined financially, a situation from which he never recovered. He then led his men to Fort Niagara by traveling down the western bank of the Niagara River and slipping into the Fort on 10 July. On St. Andrews Day, 1759 Fort Niagara's new Commandant, Lt. Colonel William Eyre, took pen in hand to write to Major General Jeffrey Amherst, His Majesty's commander in North America. Cold weather was closing in on Fort Niagara and Eyre feared that the coming winter would lead to an outbreak of scurvy among the garrison. Since capturing the Fort the previous July, soldiers had focused on filling siege trenches and repairing the Fort's damaged barracks. There were no fresh vegetables or fruits to ward off the dreaded disease. 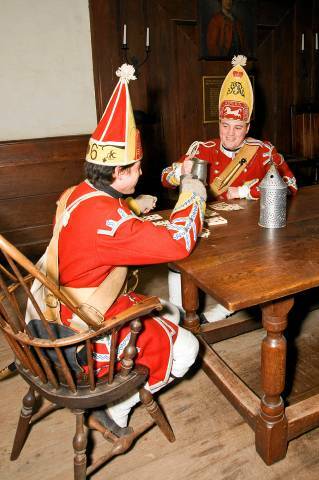 One supposed remedy for scurvy was spruce beer, a beverage often issued to British soldiers. Spruce beer was made from a mixture of molasses, yeast, fresh spruce tips, and water and took only a few days to be ready for consumption. The spruce tips provided the vitamin C, but the fermentation process reduced the amount that ended up in the beer. Eyre's problem was that he had no molasses to make spruce beer. He looked ahead to a dismal winter in a strange land, subsisting on a diet of bread and salted meat. Eyre had served long enough to realize that he was confronted with a recipe for disaster. By the time he arrived at Fort Niagara in November 1759, Lt. Colonel William Eyre was a veteran of many years service in the British Army. During the 1740s he served in Scotland and in the Low Countries. He accompanied General Braddock's expedition to America in 1755 as a Captain in the 44th Regiment. A talented engineer, he constructed Forts Edward and William Henry on the Hudson/Lake George portage. As commander of the latter post, he successfully defended the Fort against a strong French and Indian raid in March 1757. The following year Eyre was wounded in the assault on Fort Carillon (Ticonderoga). When Fort Niagara's commandant, Lt. Colonel William Farquhar died of “flue and fever” in October 1759, Eyre was dispatched by General Amherst to replace him. By January, Eyre's fears were realized as men began to complain of bleeding gums, wobbly teeth, atrocious bad breath, lethargy and weakness. The disease, if left unchecked, would result in a slow, agonizing death for many of its victims. Scurvy occurs when the human body is denied an adequate supply of vitamin C (ascorbic acid), causing the body's connective tissue to degenerate. For centuries scurvy remained a medical mystery. The cause of the disease was widely regarded as the result of a virus or “evil vapors.” By the early 17th century, the British medical profession knew that scurvy was caused by diet not virus. In 1734 the Polish-born Dutch theologian and scientist Johann Bachstrom published a treatise on scurvy in which he observed scurvy is solely owing to a total abstinence from fresh vegetable food, and greens, which is alone the primary cause of the disease. In 1747 Scottish naval surgeon James Lind proved that scurvy could be treated by supplementing the diet with fresh fruits and vegetables. Lind published “A Treatise of the Scurvy” in 1753. 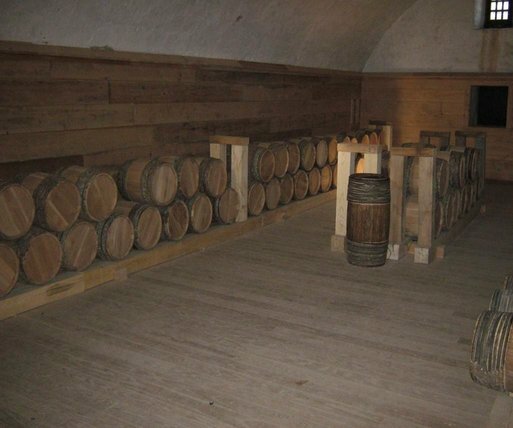 Various measures were taken to ship the needed supplies to Fort Niagara. In mid-February, General Thomas Gage promised to send vinegar and lime juice from Albany to Oswego by sleigh. Eyre in turn dispatched a boat to Oswego for medicine, vinegar, and molasses. By early March a supply of vinegar, lime juice and cabbage was forwarded from Oswego to Niagara but the supplies were not quick in arriving and 123 men were dead by the middle of April. In the meantime, Eyre looked to the woods and the lake for the solution to the problem. By early February he ordered the garrison into the nearby woods to look for sassafras, an herb thought to possess great medicinal value. Products of the sassafras tree had been used by Native Americans for centuries. Europeans shipped quantities of sassafras back to England and Continental Europe for the manufacture of teas and poultices. It was believed that the root bark, when crushed and steeped in boiling water could reduce fevers, soothe rheumatism, gout, dropsy, relieve eye inflammation, ease menstrual pain and even serve as a cure for syphilis and gonorrhea. If fermented, sassafras root could be used to make molasses and beer. Eyre also took other measures. Fishing nets were procured and the men started harvesting the bounty of Lake Ontario. Others gathered watercress in the woods. By early May a palisaded garden was well underway. Eyre reported to Gage on May 8, Our people in general is growing better and indeed much faster than I expected. Our fish and Beer helps us much and I keep constantly Men out gathering Greens of different kinds in the woods for the Sick. (Gage Papers, v. 6) The same day Eyre wrote to Amherst The men in general are mending fast. We still continue to catch Fish enough to Supply the Garrison, and our Beer, I think grows better. I am building a Brew house close to the water side which will be more convenient than having one in the Fort. The crisis had passed. A total of 149 men died of scurvy the winter of 1760. Had the brew house helped end the crisis? It is unlikely that it contributed substantially to the cure. Hickory contains trace elements of vitamin C but it is more likely that Eyre's other measures were more effective. Nonetheless Colonel Eyre's efforts the winter of 1760 led to the construction of western New York's first documented brewery.